FitnessRX for Women > Nutrition > Supplements > How Much Protein to Increase Lean Body Mass? If you want to increase lean body mass and become stronger, healthier and more confident, it’s essential to know the importance of protein intake and how it can be used to help you improve fitness. The amino acids in protein serve as building blocks for muscle proteins and as chemical signalers for turning on protein synthesis after exercise, increasing lean body mass, or muscle. Consuming a protein supplement after weight training stimulates muscle protein synthesis more than weight training or a supplement alone. But how much protein is enough to stimulate protein synthesis and improve body composition? A study led by Daniel Moore from McMaster University in Canada found that consuming 20 grams of protein was optimal for promoting protein synthesis after training. Researchers used chemical tracers to measure protein synthesis after consuming drinks containing 0, 5, 10, 20 or 40 grams of egg protein. Protein synthesis increased with each increment of protein but peaked at 20 grams. Weight training promotes muscle protein synthesis for about 24 hours. Serious weight trainers can maximize protein synthesis by consuming 20 grams of protein up to about six times a day. The body will use any extra protein as fuel, which are very expensive calories. Consuming protein after exercise, as a meal or as part of a supplement, turns on protein synthesis and maximizes the benefit of your exercise program. A Dutch study of older and younger subjects also found that consuming protein after exercise boosted protein synthesis, and age did not influence the results. 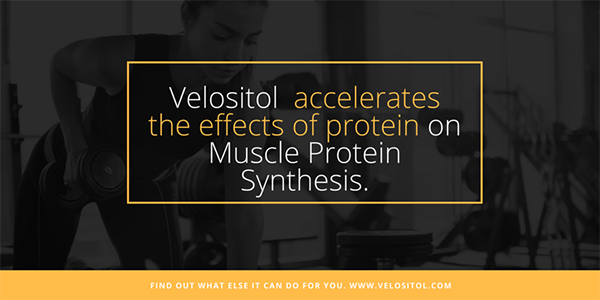 Look for a protein supplement that contains Velositol®, which amplifies muscle protein synthesis beyond protein alone. When added to protein, Velositol® actually doubles the power of protein on muscle protein synthesis to boost your workouts and help you achieve the results in the gym that you are looking for.